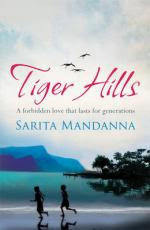 Tiger Hills, the debut novel by Sarita Mandanna is an epic tragic love story that runs through generations. The story is set in Coorg in Southern India, beginning in the late 1800s through the war time years of the 20th century. Mandanna has given such vivid description of Coorg's luscious landscape, green jungles, rich cultural tradition and food that one can immediately be involved and submerged in the story and be completely entranced by it. The main protagonist of the story, Devi is the first girl to be born to the Nachimandas in over sixty years. Beautiful, spirited Devi is the apple of every one's eyes in her entire family. She befriends Devanna, a gifted young boy whose mother died of tragic circumstances. The two quickly become inseparable, like two eggs in a nest / two seeds in a cardamom pods, as they grow up amidst the luscious jungles, rolling hills and rich coffee plantations of Coorg. Their future seem inevitably linked, but everything changes when one night Devi attends a tiger wedding, a function held to honor the brave tiger killer, Machu and celebrate his feat of killing a tiger. Machu is a great hunter and is a cousin of Devanna. The moment Devi sees him, she has the desire to be his wife one day. It was love at first sight for Devi and it is this love that will creat a rift between Devi and Devanna that will eventually widen. Meanwhile, Devanna's aptitude in the academic studies is noted by the head of the local mission school from Germany, Hermann Gundert. Gundert treats Devanna like a son and nurtures him for medical studies. He has high hopes from him, for he thinks Devanna will be the inspiration for the people of Coorg to embrace Christianity. But, one action by Devanna in a fit of grief shatters Gundert's hope and with it changes the lives of many concerned, sowing the seeds of a tradegy that will have consequences that will last for generations. The novel is named after a coffee plantation estate 'Nari Malai'-Tiger Hills which is subsequently owned by Devi. The novel has many characters and if I were to simple write the plot of the story, it will run into a number of pages. The story is mostly about Devi and the two men in her life Devanna and Machu. There is proper masala for a love triangle and yet, strangely enough it is sustained till the end of the story. In the beginning of the novel, Devi was portrayed as a child of destiny for her birth was marked by a folk of herons, but eventually it pains the readers to see how her life is jeopardised and how she tries to strike a balance between love and hatred in her life. What I despised about Devi was her partial behavior towards Machu's son and her frequent indifference about her own son. I could not think of how a mother could act the way Devi did whatever the reason. The story is about the sufferings that love brings, for they are the two sides of the same coin, the suffering that Devi at large endured, the suffering of Devanna, Machu and their sons and also of Gundert who had pinned great hopes on Devanna. Yet, finally comes the message that one has to learn to reconcile with their fate and find happiness in what they have received in life. I love the way Mandanna has given words to the emotions of the characters in the novel. I loved it for the sheer vividness and details of the story. I will definitely recommend reading it. I loved it too..beautiful review, Jyoti ! I saw some interviews by Mandana - the woman is extremely well-spoken and grounded.